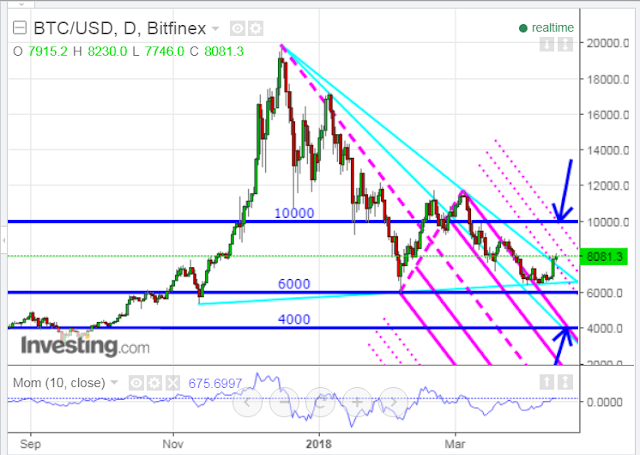 As shown on the daily chart below, Bitcoin has recently broken above several types of resistance, namely a downtrending Andrew’s Pitchfork channel, and two downtrend lines. Keep an eye on the momentum indicator. It’s in the process of forming a higher swing high, hinting of further strength ahead, but we’d need to see a series of higher price swing highs and lows to suggest that its downtrend has reversed with any conviction. In the meantime, no doubt we’ll see lots of wild daily price swings.